A dog's natural instinct is to bark when they feel their territorially is being compromised by another dog or human visitors. They consider it their obligation to alert you of an impending threat to your property, which is of course, their property as well. 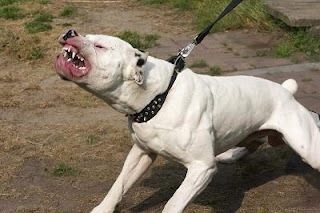 In some cases, dog owners appreciate the warning that their dog bark provides them however, excessive dog barking can become a behavior problem, and here we look at some practical tips, which will allow you to control your dog's behavior and will with patience, cease excessive dog barking. As soon as you observe your dog excessively barking at visitors or passers-by to your property the first thing to consider is rather than disciplining the dog, will be to teach ourselves and the animal that this type of behavior should be rewarded. Inconsistent commands by dog owners are the primary reason for excessive dog behavior and the key you and your dog need to learn is consistency. Inconsistent messages given by you to your dog will develop into confusion and an inability for your dog to retain any of the learned behavior which you're trying to teach. 1. Whenever your dog barks at visitor passing by your property allow him to bark for two or three occasions. It is important to praise your dog alerting you of the impending visitor, and should, however gently request that the dog is now quiet. If the dog ceases to bark for a few seconds praise him and offer them a reward. This will help focus your dog on the command. 2. Provide them with a treat as soon as they are quiet and consistently praised them for doing so. Ultimately, any discipline directed at the dog should be for disobeying your command rather than the barking itself (this applies to any dog behavioral problems). As above, always be consistent with your dog. You will always be setting yourself up to fail if you offer him or her inconsistent messages. While it will take several occurrences for your dog to learn that barking is not a bad behavior, consistent messages applied by you to reward quietness after the act will remedy the problem of excessive dog barking. This technique can also be applied for many other dogs behavioral issues and this simple two stage process of command and reward is excellent practice for the future. It will ensure that you and your dog relationship will blossom upon mutual respect and understanding. As we have just learned, consistent and confident commands are the key to dog training success and it cannot be over emphasized how important the early stages of a dogs development are for the future prosperity of both dog and owner. Puppy Training Dogs would like to invite you to effectively and simply learn the best principles required in training your dog. This unique technique, developed specifically for new dog owners, has helped thousands of people promote and maintain the best relationships between dogs and owners. Visit Puppy Training Dogs to participate in this valuable course. When you think of a hunting scene, what do you imagine? Perhaps you see a man in camouflage clothes, toting a rifle. Perhaps you see a proper British man in red jacket and knee high black boots on horseback. And probably, no matter how you picture the people, there's a hunting dog nearby. Dogs have been great companions to hunters for hundreds of years. They provide friendship, of course, but can also help a hunter be more effective in the field by tracking, flushing, pointing, and retrieving game. When you're training a dog to hunt with you, it's important to make sure your dog is trained properly and knows exactly what's expected of him in the field. One tip that's repeated over and over by trainers is to start your dog in training early. It's much easier to train a puppy than a full grown dog. And by training early, you ensure more hunting time with a well trained dog. The first piece of advice given to all dog trainers is to be patient. It takes dogs time to learn commands, and you shouldn't expect too much too soon. After all, it takes humans time to learn new things, so why should you expect more from your dog? Along with patience, you should make sure you introduce your dog to commands slowly. If you try to do too much at once, your dog will get overwhelmed, and you won't get anywhere. This is frustrating to both you and your dog. Consistency is another point that's stressed to trainers. Once you decide what commands to use, whether they be verbal, hand gestures, or even whistles, make sure you stick to what's set down. If you start training a dog to sit, for example, by saying "Sit," and then suddenly make a whistling sound to command the dog to sit instead, your dog won't know what you want, and you'll set your training back. Praising your dog for obedience and good behavior is a very good way to get results quicker. Dogs respond well to positive reinforcement. If they know they'll get positive attention, they're more likely to repeat the behavior. Even if you think the good behavior is something "minor," give your dog a friendly pat on the head and a "Good boy!" to let him know he's doing a good job. The proper training of your dog for the hunt is important. And while it may be a little overwhelming at first, patience, consistency, and praise can lead to a great hunting companion for any hunter. Training a dog to hunt with you is a lot of fun. Make sure you have the proper Dog Supplies and the proper Dog Training Supplies. Visit premierdogsupplies.com for all you will need.